The aesthetic qualities of ancient Egyptian art are greatly admired in our modern day and age, however the concept of art for art's sake was non-existent in ancient Egypt. Although the Egyptians did aim for great aesthetic levels in their art, they did not create masterpieces for the simple pleasure of admiring them. Egyptian art was, for all intent and purposes, a religious and funerary art that played a significant part in the cult of the gods and the dead. The magnificent art pieces displayed in museums across the world are now out of their original context and, understandably, it is sometimes difficult to understand their significance. 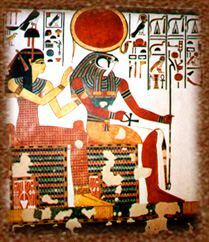 Colourful paintings and reliefs, which once decorated the walls of tombs of Pharaoh and the royal family, wealthy officials, courtiers, and nobles, ensured the survival of the deceased in the afterlife. Sculptures could serve as a home for the " kâ " of the deceased (his spiritual essence) while others would be ex-voto and gifts offered to a deity. Some statues were even the manifestation of gods residing in a temple, where priests performed daily rituals and saw to the well being of the god. Although the Egyptians expressed themselves and their culture in many artistic ways, the present text deals solely with the so-called "major arts" : sculpture, painting, and sculptured relief. Architecture, which is also one of the major arts, will not be discussed here since it is rather lengthy a topic. Painting and sculpture are two artistic expressions with which all are familiar, however, the principle of sculptured relief might be foreign to many. Sculptured reliefs, in very simple words, are basically drawings that have been carved on flat surfaces, stone walls and slabs being the prominent surfaces. Once the desired figure has been drawn on the wall, the artist can remove a thickness of the flat surface around the figure, giving the impression that the figure sticks out from the wall. Such type of relief is known as "raised relief." On the other hand, if the artist carves the contours of the figure and the figure itself really deep into the wall, the illusion of the figure being embedded in the wall is created. This is called "sunk relief." Sunlight dance and play with the carvings, thus creating shadows that give the reliefs a certain fullness and roundness impossible with pictures simply drawn on a wall. Such is the beauty of sculptured reliefs. Ancient Egyptian art, like any other artistic expression of a given period, reflected the social and cultural milieu from which it emerged. Additionally, the physical and geographical environment played a major role in the initial development of what may be define as typical Egyptian art. A quick glance at a geographical map of Egypt reveals a country bordered by fantastic natural frontiers. The northern border was the Mediterranean Sea, a formidable body of water, which only the most adventurous merchants would dare cross. The Sahara Desert (also called the Western Desert) separated Egypt from its western neighbour, Libya. Another desert, the Eastern Desert, which the Egyptians believed was filled with monsters, stretched between the Red Sea Coast and the Nile Valley, creating the eastern border. South, the Batn el-Haggar (the Belly of the Stones), a most desolate and arid region between the Third and Second Cataracts of the Nile River, in Nubia, was another excellent natural border. In addition to the Batn el-Haggar, the numerous cataracts on the river made sailing into Egypt from the south extremely perilous. Although arid deserts, dangerous seas, and cataracts surrounded the country, Egypt was nevertheless a very fertile and promising land. The regular and predictable floods of the Nile River left a thick black silt that fertilised the land, thus allowing peasants and pastoralists to settle in the valley and prosper. Moreover, within the boundaries of Egypt, the Nile is free of cataracts and thus navigable. Egypt was truly the 'gift of the Nile'. Such geographical isolation and luxurious environment resulted in a self-reliant and self-sufficient civilisation. The Egyptians were aware of the richness of their land and its life-giving river, and they were intimately attached to it. According to them, there was no place like home. Not surprisingly, the recurrent motif in Predynastic art, as seen on decorated ceramics, was a boat with many oars and a deck cabin. Additionally, hunting and pastoral scenes as well as vegetal motifs displayed the richness of the Egyptian fauna and flora. However, this does not imply that the ancient Egyptians were totally devoid of foreign contact. On the contrary. Egypt maintained commercial contacts with its neighbours, Mesopotamia among others, and the influence of such contacts can be seen in art of the Predynastic period. A typical Mesopotamian motif borrowed by the Egyptians can been seen on wall paintings and on artefacts, such as the ivory handle of the so-called Gebel el-Arak knife (Louvre Museum, Paris): the man wrestling two beasts. Although the Egyptians borrowed a few artistic elements from their northeast neighbour, they had already begun to culturally and artistically define themselves and develop a style that could be identified as typically Egyptian. Indeed, the artistic conventions adopted during the later part of this early period were to regulate Egyptian art for the next 3000 years. Following the unification of Upper and Lower Egypt, in spite of the regular commercial ventures abroad, foreign motifs were almost never used in the next three millennia of intense artistic activity. Instead, internal politics, periods of economic prosperity as well as social and religious values were to influence art. Expectedly, the art of the Old Kingdom reflects the economic prosperity of the country and the skill of the artists trained in royal workshops while the crude sculptures and paintings of the First Intermediate Period are the result of a country stricken by famine and civil war, where untrained artisans imitated to the best of their ability the art of the previous epoch. Yet, the most incredible change of artistic values occurred during a very prosperous age (end of the Eighteenth Dynasty, New Kingdom), at the instigation of Pharaoh Akhenaton (Amenhotep IV), the heretic king. 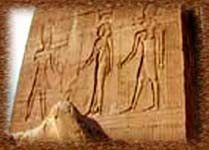 Akhenaton favoured the cult of the solar disk Aten above Amun, the national god, and all the other deities of the Egyptian pantheon. Serious changes in the artistic repertoire and Canon of human proportions thus resulted from Akhenaton's reign and this religious revolution. Egyptologists refer to this interlude as the Amarna period. King Tutankhamun, and the last pharaohs of the Eighteenth Dynasty, who ruled after him, reinstated the traditional artistic norms and former religious beliefs. Despite the Amarna interlude, New Kingdom art equalled and, according to many, surpassed in quality and beauty the masterpieces of the Old Kingdom. The Late Period, which is often considered a period of decline because of the decentralisation of imperial power, competing dynasties, and various invasions, nevertheless reveals that many of the rulers kept the ancient traditions alive, inspired by the glories of the past. As Alexander the Great conquered the Near East, a wave of Greek influence followed him. Egypt, which had initially inspired Greece (Hellas), was not immune to Greek (Hellene) influence. Hellenisation of Egyptian art was more or less subtle, yet present. Later Roman influence, however, was more than obvious.